I have received several questions regarding the organic scroller preview. The code will be released when Paul Taylor releases the final set of TinyTLF demos (layouts are currently being refactored). 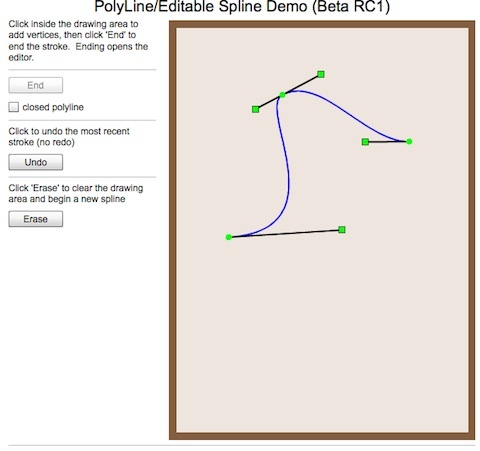 Our collaborative work will illustrate html text laid out respecting a spline boundary with the right boundary serving as a dynamic scroller component. I’ll provide a brief overview of how the scroller works in this post. A detailed deconstruction is a topic for a later white paper or book chapter. 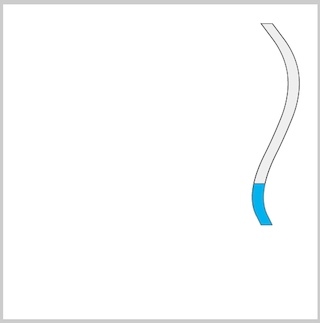 The boundary spline is a G-1 continuous quadratic Bezier spline. The spline is generally non-interpolative and has a tension parameter. I tend to like 0.3 a lot 🙂 The spline interpolates the first and last points. Interior control points influence the shape of the spline, but the spline does not necessarily interpolate those points. I’ve covered the spline in past posts and its fundamentally the same algorithm I implemented in the Degrafa quadratic spline. 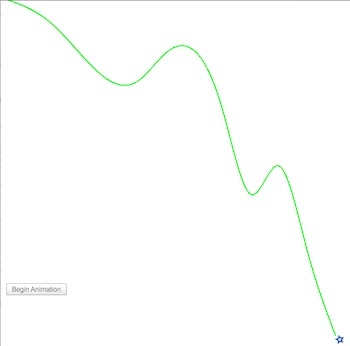 As the spline is naturally composed of quadratic Bezier segments, it constructs and renders fast. The scroller thumb length is a fraction in [0,1] representing the fraction of the total boundary spline length to use when rendering the thumb. The component maps the thumb value to arc length in [s1,s2] so that the thumb length is preserved and the midpoint of the thumb (in arc length) represents the thumb value. Now, for the fun part. The scroller class returns a vector of quadratic Bezier instances representing the path along the boundary from arc length s1 to arc length s2. This is an exercise in deCasteljau subdivision. Subdividing a quadratic Bezier at parameter t produces two independent quadratic Beziers that exactly represent segments of the original curve. The first quadratic represents the original curve in [0,t]. 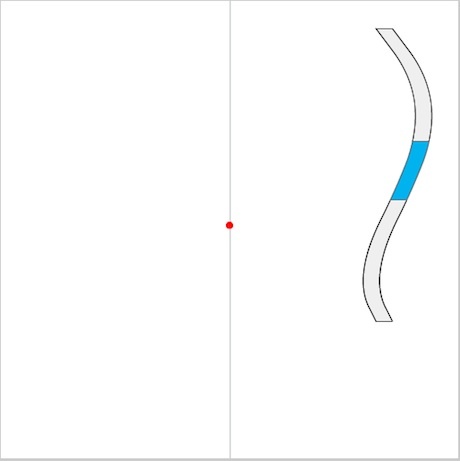 The second represents the original curve in [t,1]. The subdivision code was modified to return coefficients of either segment. That’s fine when s1 and s2 represent points in different quadratic segments. The situation is more subtle when s1 and s2 are in the same quad. This involves refining the original quadratic Bezier in the interval [s1,s2]. Once the vector of quadratic Bezier coefficients is returned, the thumb can be drawn quickly with the usual moveTo(), lineTo(), curveTo(). Interactivity is also an issue. For a vertical scroller, vertical mouse movements do not map linearly into scroller arc length. Attempting to do so may cause the scroller to jump erratically in some configurations. Instead, a quadratic model for mapping vertical mouse movements into thumb value is employed. I suspect there is still some tweaking to do (isn’t there aways), so I’ll continue to provide updates. In the mean time, the next background project is arc-length parameterization of a general path, which may be both spatially discontinuous and likely discontinuous in first derivative. Just a quick note to say hello from Adobe MAX in LA. This is a short preview of a project I’ve been working on with Paul Taylor. 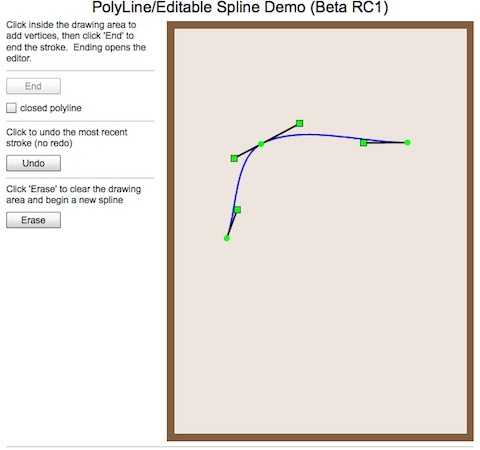 At 360|Flex, we showed a demo where TinyTLF was used to layout text respecting a spline boundary. Paul showed scrolling with TinyTLF here at the 360|Flex Unconference. The next natural progression is to have both the text boundary and the scroller be organic; that is, both are based on the same Bezier spline. The scroller itself and the thumb are dynamically rendered in Actionscript. The small image below shows a preview of one test case. Needless to say, there is a *lot* of math involved ranging from arc-length parameterization to interpolation models to a nonlinear model for scroller thumb interaction. The alpha component is being turned over to Paul for integration into a TinyTLF demo and further testing. Once it’s solid, we will work on a vehicle for distributing the code, which will include at least a white paper on all the math used in the scroller construction. Tensions in the range -1 to 3 are supported. Negative tension ‘loosens’ the fit. Tensions greater than 1 cause the spline to loop in on itself going into and out of each knot. The effect at initial and terminal knots depends on how the auxiliary control points are chosen (same options as the C-R spline). I’m preparing for a long business trip, so posts and Degrafa updates will be sparse over the next several weeks. 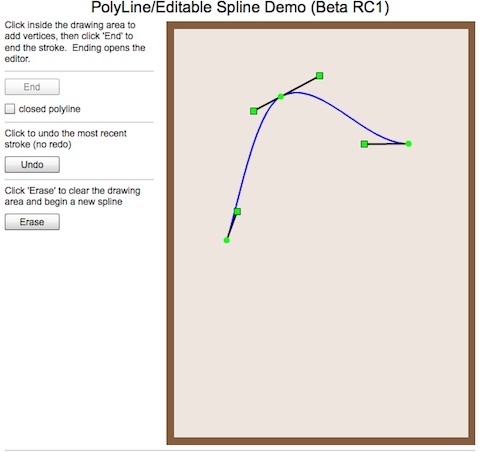 The quadratic Hermite spline is now available in the Origin branch. It works pretty much like any of the other splines with the exception of the method to manually assign the start tangent. The default is automatic selection of start tangent, which uses the reflection discussed in this post. A screenshot is provided below. The blue curve results from plotting the low-level utility upon which the Degrafa spline is based. It is plotted old-school, point-to-point with manual start tangent. The red curve is the Degrafa spline fitting the same set of points in MXML with automatic selection of start tangent, and approximated by quadratic Beziers in the Degrafa command stack. The next screenshot shows what happens if the start tangent is arbitrarily set to the point (100,100).